The first half was an “origin story”. That said, its not as if its a character or set of characters that has a really well known origin. Also, the origin is very well developed, and true to the canon comics, as well, for the most part. As typical comic movies, there is a “growth” of the hero. There is a definite series of “moral” lessons, although at times they hit the viewer over the head like the cast iron skillet of wisdom. The effect of building bending and space bending might be a bit overplayed for some peoples tastes. The criticisms out of the way, it’s a movie, suspend disbelief, or “forget all you think you know” and have fun with it. There are some interesting references to actual grimoires, energy maps of the body, and philosophy. There are some interesting depictions and portrayals of the astral body as well. 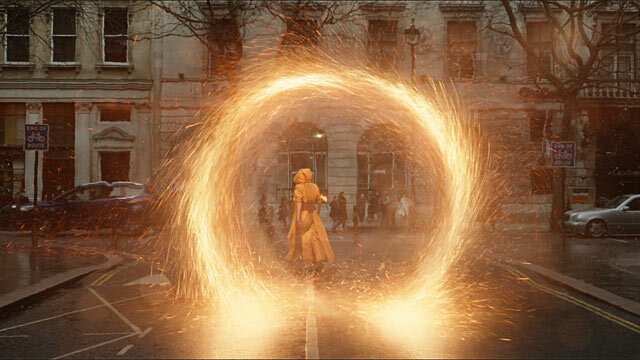 Magic is not explained away, as it nearly seemed to be in Thor, but made even more fantastic. I personally envy not only the books in the library, but the “racks” on which the books were kept. I’m gonna have to make me some of those. There is a martial arts practice that resembles kung fu and tai chi mixed, and “shows” the energy. It is not solely reliant on Dr. Strange (Cumberbatch) , but also supported well in the cast by Wong the barbarian librarian, and Mordo as they fight the disciples of Kaecilius leading to a very intelligent, challenging battle royale between Dr. Strange and Kaecilius himself . My favorite co star though is the Cloak of Levitation. There is the , oh by the way “something something infinity stone something” tie in. The costumes are amazing, as well they should, as when watching the credits, there are more people listed under costuming than any other part of the movie. I look forward to talking to you more about it next week after you’ve had a chance to see it, and we get together at Pandoracon.